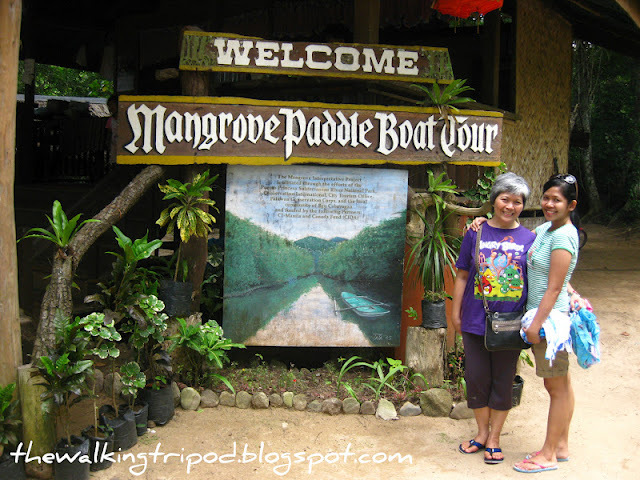 After taking our lunch and rested at Sabang Beach, our tour guide Mae-Anne asked if we wanted to join the newlyweds for the Mangrove Paddle Boat Tour. We agreed of course, after all, our Underground River Tour was scheduled at around 3-3:30pm. We left the other group who chose to stay and relax at the beach while we hopped on the van that took us to where the mangroves are. During the very short drive, we saw tourists mostly foreign backpackers, walking their way to the much secluded part of Sabang Beach where the mangrove tour is also located. It was like 12 noon and they're really loving the Palawan sun! 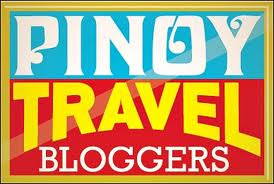 Upon arrival, we registered and paid the Php150 fee. 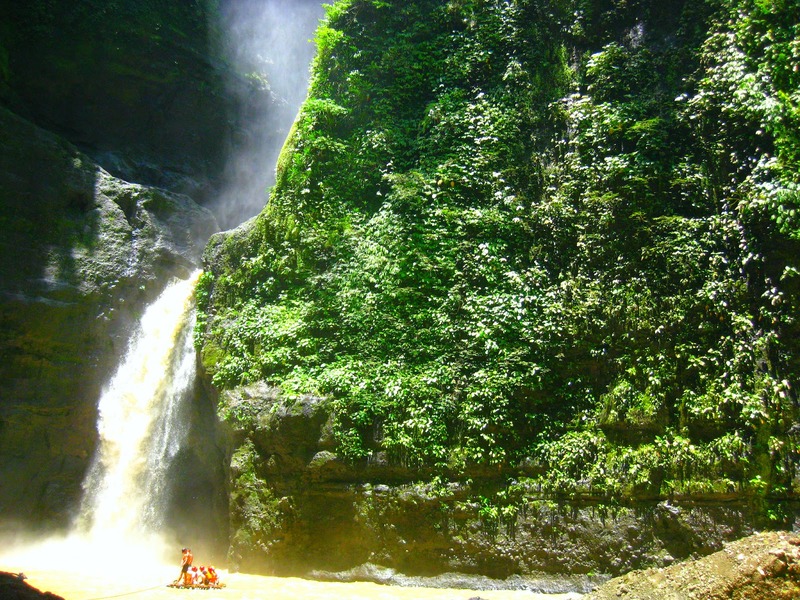 The area wasn't as crowded compared to other tourist spots, seems like only a few takes this tour as many chooses the more adventure spot, Ugong Rock Caving and Spelunking. And because it was scorching hot that noon, we were given umbrellas and put on standard life vests. 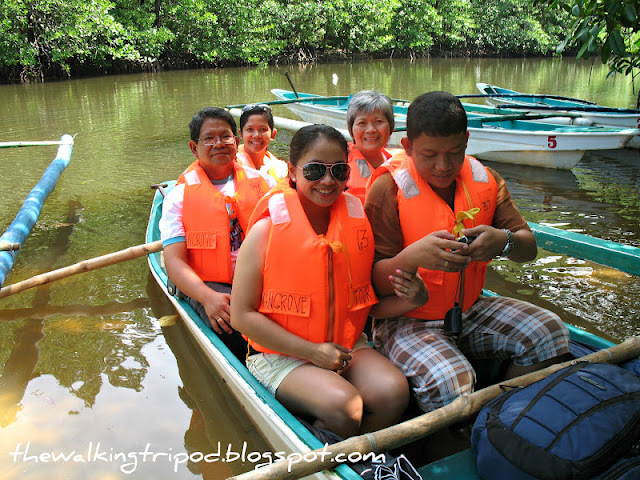 There were 7 of us in the boat including our guide and boatman Mang Nestor. 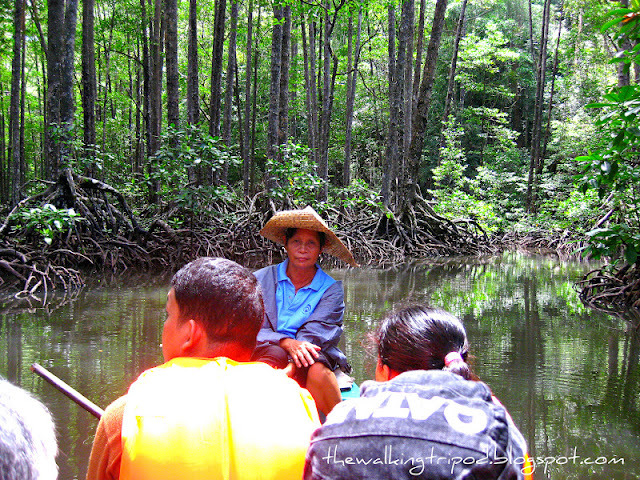 As we paddled along Sabang river amidst hundred year old trees, our guide who introduced herself as Lady Mangrove started off by welcoming us in Palawan. She was also proud to report that Underground River made it to the New 7 Wonders of Nature, then shortly educating us about the many species of mangrove trees or bakawan. Male and female bakawan can be differentiated through their leaves. 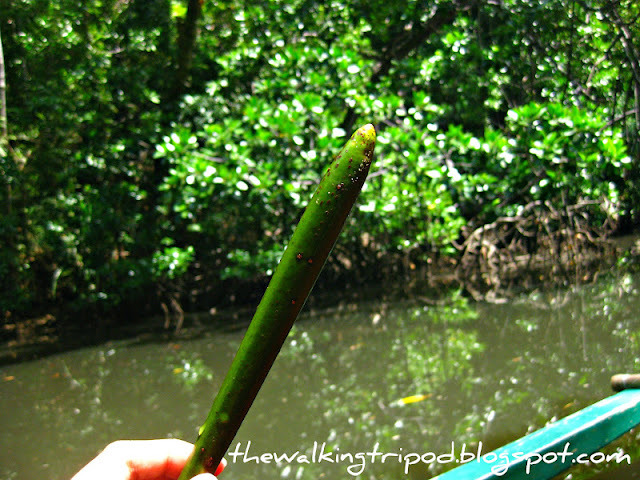 Tamilok, a famous and "feared" worm-like local delicacy in Palawan which tastes like oyster can be found inside dead mangroves. 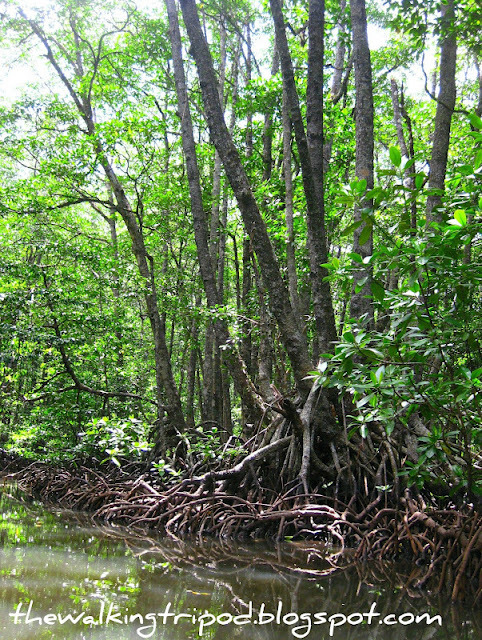 Some 20 minutes after and deeper into the mangrove forest, we found ourselves taking refuge under shades of natural canopies, far from the sun’s mighty reach. 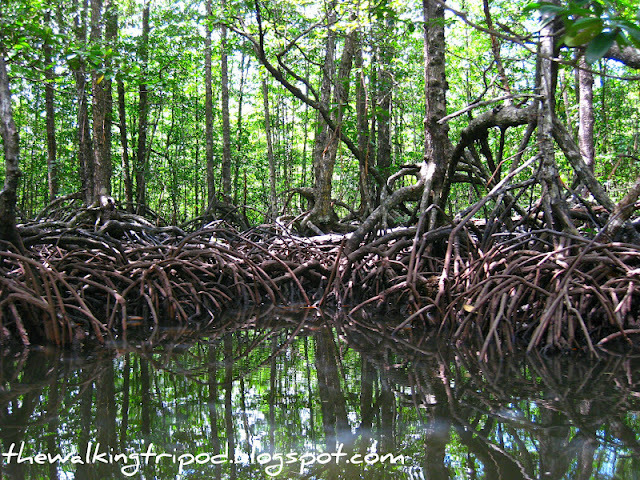 We learned that these hundred year old mangrove trees can only be seen in Palawan. We're like in the middle of nowhere where one gets that strong commune with nature, with sounds from crickets and a couple of nocturnal snakes hanging above trees, it somehow feels like I'm in an Amazon rainforest. Life is but a dream indeed. Cruising along the Sabang River, it was crystal clear to me that every Filipinos should dream to see Palawan for it has so much to offer in terms of nature appreciation. Right after Lady Mangrove sung her composed piece (in the tune of Paru-parong bukid), I can’t help but gain new found respect for the locals of Sabang. We also made sure to plant mangrove saplings to help in the conservation process. 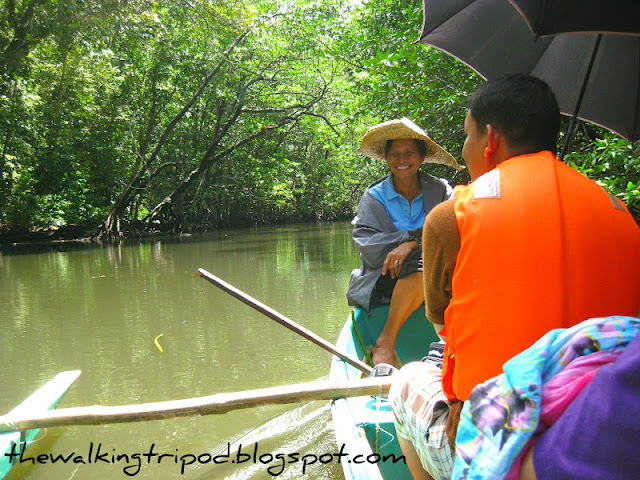 For a cheap Php150, this Mangrove Paddle Boat Tour is a totally worthwhile experience. If not for these humble mangroves important role in coastal ecosystem, Palawan's world acclaimed beaches wouldn't be what it is now, a world-class beauty. 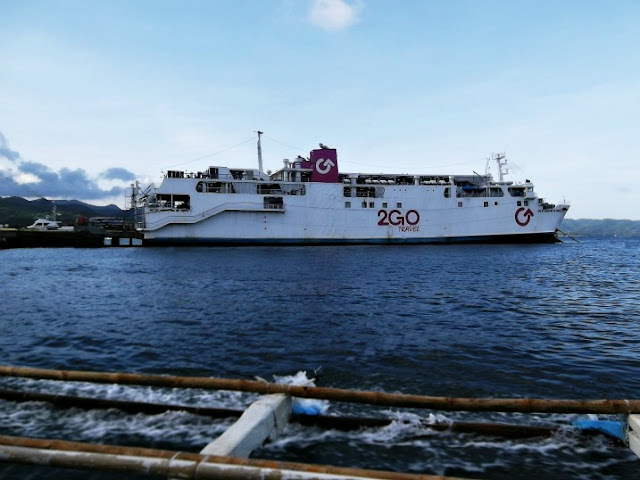 Palawan contains 43% of the total mangrove forests of the Philippines and Puerto Princesa is a city in the country where the total area of mangrove forests do not decline, but are increasing. The minute I got off that boat, I made a mental note to endorse this tour in my own little way. 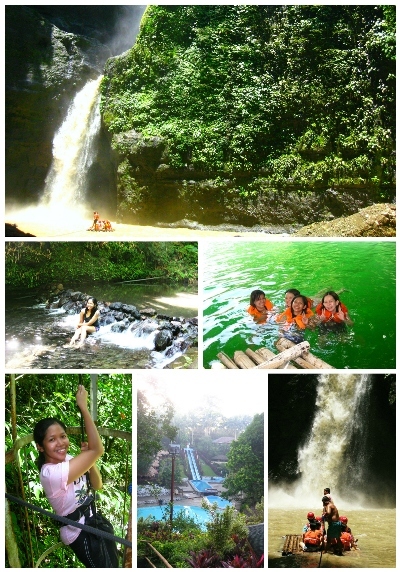 so this is somewhere away from Busuanga.. ?